DIAdem is a software environment from National Instruments for use on standard desktop PCs and laptops. It is used wherever measurement and analysis data is generated. vMeasure Option DIAdem and vMeasure Option DIAdem Basic extend the functional scope of DIAdem with the acquisition of bus signals which are defined in a database. vMeasure Option DIAdem accesses bus signals exclusively by their symbolic names. The raw data is converted automatically into physical values. This is done using conversion rules from the database. If the bus configuration (e.g. conversion rules) changes, it is only necessary to edit the database. The references in the DIAdem measurement structure can be updated automatically. vMeasure Option DIAdem also supports the J1939 protocol (mixed mode J1939 and extended CAN IDs). 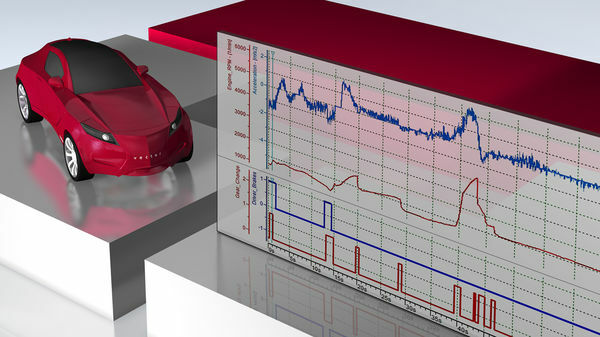 vMeasure Option DIAdem can be used in all phases of the development and production of vehicles, where measurement data must be analyzed, compared and presented together with the results in meaningful reports. vMeasure Option DIAdem supports simultaneous use of up to 200 CAN channels or 64 FlexRay channels. Other Vector CAN tools as well as applications created with the Vector XL-Driver-Library can be used at the same time and on the same channels. Virtual CAN channels are also available for tests without hardware.